(Nanowerk News) The geometry and topology of electronic states in solids plays a central role in a wide range of modern condensed-matter systems including graphene or topological insulators. However, experimentally accessing this information has proven to be challenging, especially when the bands are not well-isolated from one another. As reported in last week’s issue of Science ("Bloch state tomography using Wilson lines"), an international team of researchers around T. Li, Prof. I. Bloch and Dr. U. Schneider from the Ludwig-Maximilians-Universität Munich and the Max Planck Institute of Quantum Optics have devised a straightforward method to probe the band geometry using ultracold atoms in an optical lattice. Their method, which combines the controlled steering of atoms through the energy bands with atom interferometry, is an important step in the endeavor to investigate geometric and topological phenomena in synthetic band structures. A wide array of fundamental phenomena in condensed matter physics, such as why some materials are insulators while others are metals, can be understood simply by examining the energies of the material’s constituent electrons. Indeed, band theory, which describes these electron energies, was one of the earliest triumphs of quantum mechanics and has driven much of the technological advances of our time, from the computer chips in our laptops to the liquid-crystal displays on our smartphones. We now know, however, that traditional band theory is incomplete. Among the most surprising and fruitful developments in modern condensed matter physics was the realization that there is more than the energies—rather, the geometric structure of the bands also plays an important role. This geometric information is responsible for much of the exotic physics in newly discovered materials such as graphene or topological insulators and underlies an array of exciting technological possibilities from spintronics to topological quantum computing. It is, however, notoriously challenging to experimentally access. Now, an international team of researchers, with experiments performed at the Ludwig-Maximilians-Universität Munich and the Max Planck Institute of Quantum Optics, has devised a straightforward method to probe the band geometry using ultracold atoms in an optical lattice, a synthetic crystal formed from standing waves of light. Their method relies on creating a system that can be described by a quantity known as the Wilson line. Although originally formulated in the context of quantum chromodynamics, Wilson lines surprisingly also describe the evolution of degenerate quantum states, i.e., quantum states with the same energy. Applied to condensed matter systems, the elements of the Wilson line directly encode the geometric structure of the bands. Therefore, to access the band geometry, the researchers need only to access the Wilson line elements. The problem, however, is that the bands of a solid are generally not degenerate. The researchers realized that there was a work-around: when moved fast enough in momentum space, the atoms no longer feel the effect of the energy bands and probe only the essential geometric information. In this regime, two bands with two different energies behave like two bands with the same energy (see Figure 1). In their work, the researchers first cooled atoms to quantum degeneracy. The atoms were then placed into an optical lattice formed by laser beams (Figure 2) to realize a system that mimics the behavior of electrons in a solid, but without the added complexities of real materials. In addition to being exceptionally clean, optical lattices are highly tunable—different types of lattice structures can be created by changing the intensity or the polarization of the light. 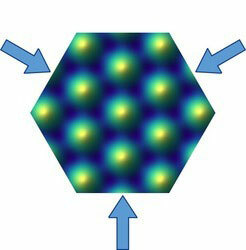 In their experiment, the researchers interfered three laser beams to form a graphene-like honeycomb lattice. Although spread out over all lattice sites, the quantum degenerate atoms carry a well-defined momentum in the light crystal. The researchers then rapidly accelerated the atoms to a different momentum and measured the amount of excitations they created. When the acceleration is fast enough, such that the system is described by the Wilson line, this straightforward measurement reveals how the electronic wavefunction at the second momentum differs from the wavefunction at the first momentum. Repeating the same experiment at many different crystal momenta would yield a complete map of how the wavefunctions change over the entire momentum space of the artificial solid. The researchers not only confirmed that it was possible to move the atoms such that the dynamics were described by two-band Wilson lines; they also revealed both the local, geometric properties and the global, topological structure of the bands. While the lowest two bands of the honeycomb lattice are known not to be topological, the results demonstrate that Wilson lines can indeed be experimentally used to probe and reveal the band geometry and topology in these novel synthetic settings.